Playing for the Cure, Brainstormin’ – A Success! 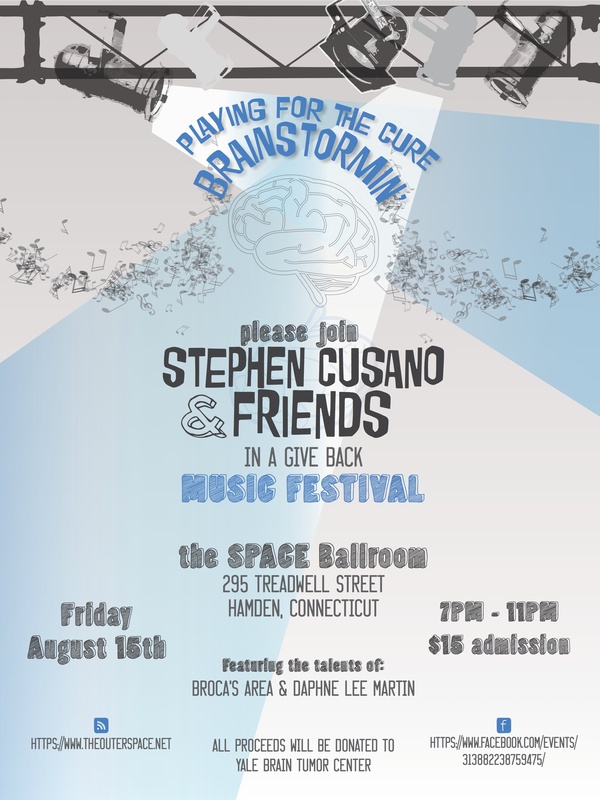 There’s one week to go until Playing for the Cure: Brainstormin’, a benefit concert for The Yale Brain Tumor Center next Friday, August 15th at The Ballroom at the Outer Space in Hamden, Connecticut. All proceeds raised will be donated to the Nora Brignolo Fund, c/o Dr. Joseph Piepmeier at the Yale Brain Tumor Center to raise awareness and research for the cure to brain tumors and brain cancer. The concert is featuring the talents of Broca’s Area and Daphne Lee Martin. Seeing that I never blogged about it until now, I’ve included a link to one of the articles here. My family and I completely overwhelmed by the show of support and generosity from the community already. A huge thank you to media outlets such as the Hartford Courant, CTNOW, The New Haven Register, The North Haven Courier and The North Haven Post; our corporate sponsors The Hartford Courant, Stop and Shop, Edge Technologies, Doug Anderson, ShelfSpace Marketing, LLC, Carla’s Pasta and Severance Foods; and to all who have donated the awesome prizes for our raffle. Your generosity and support of our effort is extremely appreciated. For me, the work and time that are expended on putting an event like this together are a no-brainer (no pun intended) and I know my family would agree. It is simple acts such as receiving a handwritten letter along with a check in the mail from a fellow brain tumor survivor, to receiving an email from a brain cancer warrior right here in Connecticut who had been looking so forward to our event letting me know that due to her medications and rigors of treatment that are currently wearing her down, it’s likely that she’ll be unable to attend but is sending a check regardless that make me realize my purpose in life and give me a sense of pride. Please help me in this final week to spread the word and help me in saying “thank you” to the doctors and caregivers who saved my life. I look forward to seeing you all at The Ballroom at The Outer Space next Friday night!